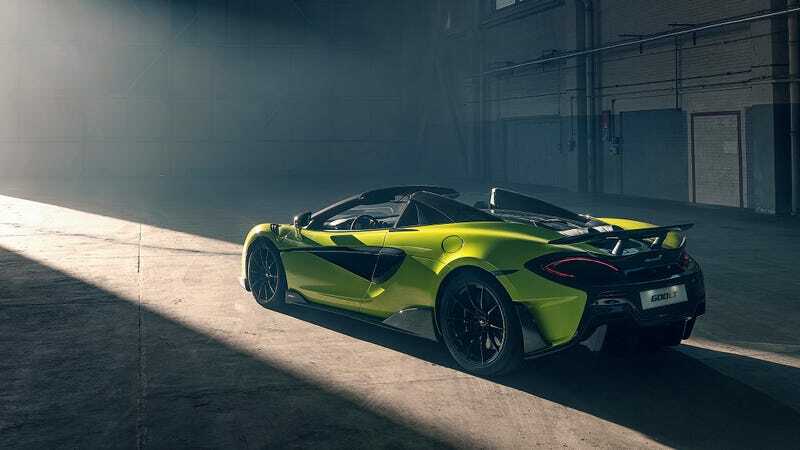 Convertibles aren’t typically my jam, but I’m willing to put aside my prejudices for the 2019 McLaren 720S Spider and McLaren 600LT Spider. I’m going to drive them both this week. What do you want to know about them? This would be my first time driving any McLaren, actually. I’ve read all the articles about how they are supposedly both incredibly fast but also incredibly comfortable to drive. I’m looking forward to checking that phenomenon myself. The 720S Spider can hit 60 mph from a stop in a claimed 2.9 seconds and its top speed is over 200 mph. The 600LT can sprint from zero to 62 mph in 2.9 seconds and has a 197-mph top speed with the top down. I don’t expect to go anywhere near that fast, but I have also packed two hair ties anyway. Prices for the 720S Spider and the 600LT Spider are $315,000 and $259,000 respectively, which is likely more money than I’ll see in the next few decades.